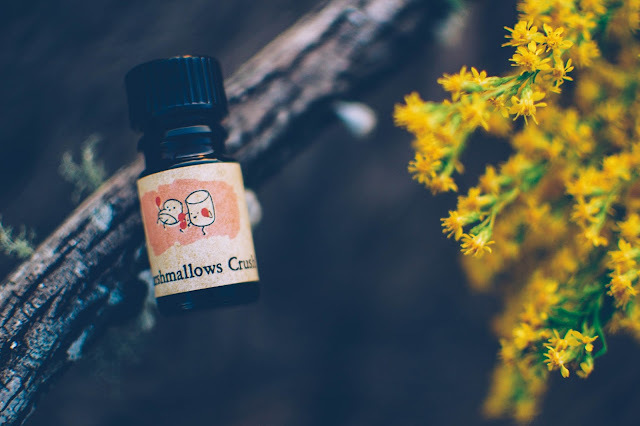 Arcana Wildcraft brewed up an eclectic line of scents that all contained marshmallows as a muse and common thread that weaves through each scent. I love the artwork and kitchy names of the scents. These pint-sized marshmallow fellas possess some serious attitude! 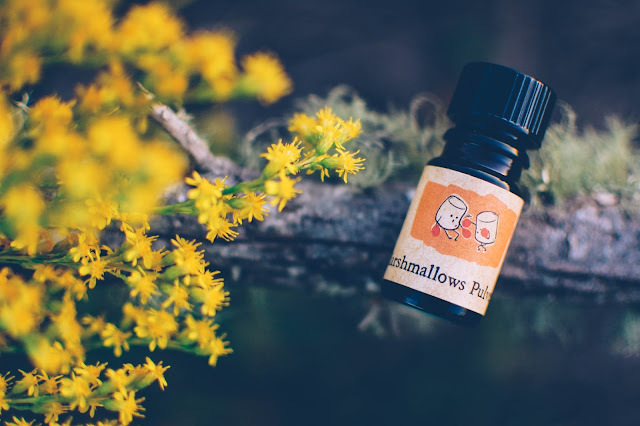 Marshmallows Pulverize!- Notes: Marshmallows with Black Sand accord (amber resin, black coconut, coconut husks and smoky vetiver). In the bottle, coconut rind and earthy dank vetiver lift up from the opening. Smeared onto the wrist, amber hardens like sap but that smoky vetiver hovers just over it like an offering. Vetiver smudge sticks, vetiver incense, vetiver haze. 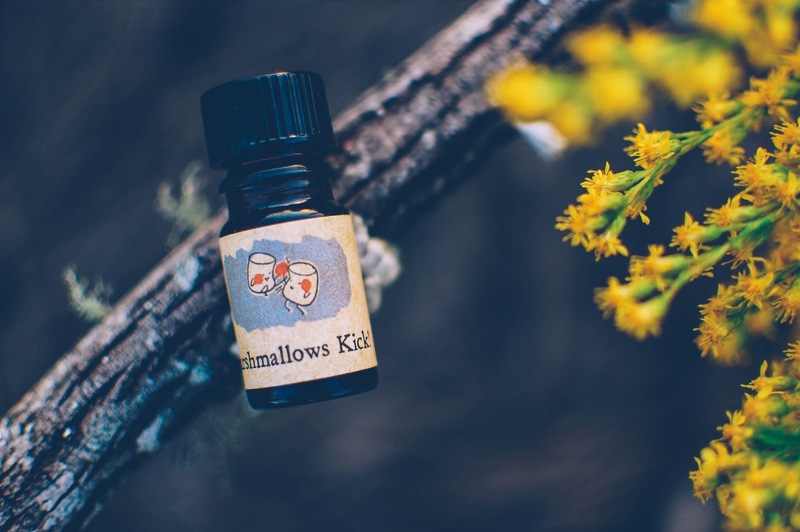 Marshmallow sugar swallows the smoke and exhales it in a dizzying breath of exotic smoky sweetness. It eddies and swirls about the body. Marshmallows Drown!- Notes: Marshmallows with crisp apple, seaweed absolute, rain, fog and a drop of neroli. Uncap the wee dram of perfume oil and immediately sweet round apples float in a metal trough full of frosted late October water, waiting for the children to bob for them with eager snapping teeth and smiling lips. Splashed onto the wrists and neroli's keen orange blossom tang cuts into the skin to peel back and reveal a fresh bushel of apples, shining and wreathed in diminutive flowers. Dewdrops perch on the delicate crowns of petals and the swelling mounds of the apples, trembling and glinting. With time the apples fade and the neroli is a lone petal on a quiet pond. Tranquil waters lapping at the wrists. Marshmallows Smoke!- Notes: Marshmallows with woodsmoke, dry black tea, dead maple leaves and a hint of vanilla. Black tea leaves, a touch of anise and a tendril of fire roasted marshmallow, smoky and charred, reach the nose upon opening the petite black cap. Steeped into the skin, that smoky black tea emerges, dark and viscous, sweet Southern gothic style. Around the edges of the tea, a freshly raked pile of leaves smolders outside a clapboard bungalow in a Louisiana bayou. A swampy fog shifts the smoky scent trail away and on but the black tea leaves remain. Vanilla embers crawl in and out of the aroma, giving the tea a slight tobacco aura. 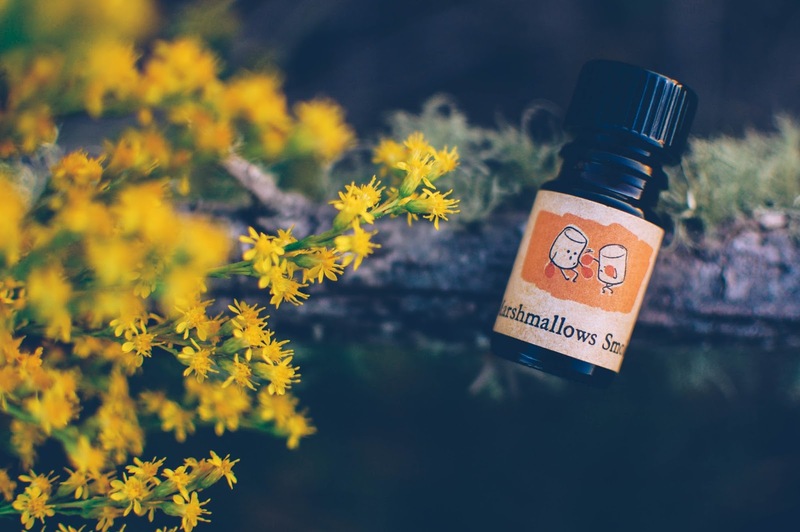 Marshmallows Kick!- Notes: Marshmallows drenched in rich honey and bee pollen with a hint of popcorn. Dripping out of the neck of the bottle comes dewy honey topped with one salty tear drop. Sweetly melancholy. Once the nectar brushes the skin, honeyed popcorn kernels burst forth, crisp and then chewy. Honey leads with the floury meal tone of bee pollen grains and airy popcorn puffs following behind. The result reminds me of salted honey oat cakes noshed by the glow of a beeswax candle on a foggy Scottish morn. Hearty with a drizzle of honey and a pinch of moodiness. Marshmallows Crush!- Notes: Marshmallows with Bourbon vanilla beans, Italian bergamot, pink pepper and French cognac absolute. Sharp bergamot, like aged orange piths rattling around in an empty brandy flask that bears the scars of use and memory, punch their way up out of the amber glass. Wet on the skin, vanilla beans speckle a bergamot creme anglaise topped with melted marshmallow. Bitter and creamy. Sweet yet sharp. As it dries the sticky marshmallows swell and curl around the citrus, muting it softly. A minute nip of floral pink pepper bites at the nose and nibbles the edges of the mallow. Eventually the flask reappears and the dregs of brandy tease the marshmallow and citrus into lightness. The last swig is taken. The scent lingers on the tongue. There are even more naughty and feisty Marshmallows in the collection, however, they will be disappearing by January 10th I believe. The Arcana Wildcraft eBay store is closed for the holidays but these can still be purchased at Nui Cobalt Designs for $20 each. My favorite of these are Marshmallows Smoke! and Marshmallows Drown! as both are very unique and evocative. The marshmallows are not overbearing in any of the scents and offer just a wisp of sweetness. Thank you for the review! Wonderfully detailed and evocative, as always! I really do love Marshmallows Drown! and I must say, neroli is truly hit or miss for me. Sometimes it is over powering and bitter and just in your face and other times if it is done with a light hand it is so lovely and bright for me. But I do know that feeling. The large selection of perfume oils is key! LOL! I must say my collection is pretty robust at this point. I rarely give away perfume like I do my wax but I am starting to part with ones I know I won't wear with any regularity. Thankfully these are 5 mls and on the small side so I know I will drain them quicker than my large bottles of perfume. 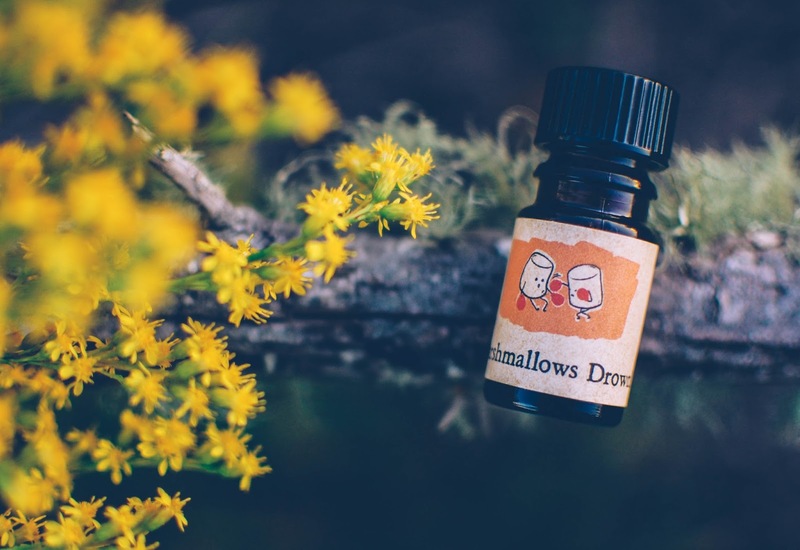 What are some of your favorite perfume oils? What an amazing proliferation of a marshmallow jam! So creative and funny. Your writing is a marvel, as always. Thank you Doreen! I love perfumes that have a muse or variation on a theme. These were fun and lighthearted and I love the array of aromas. I hope you are keeping warm up there friend!